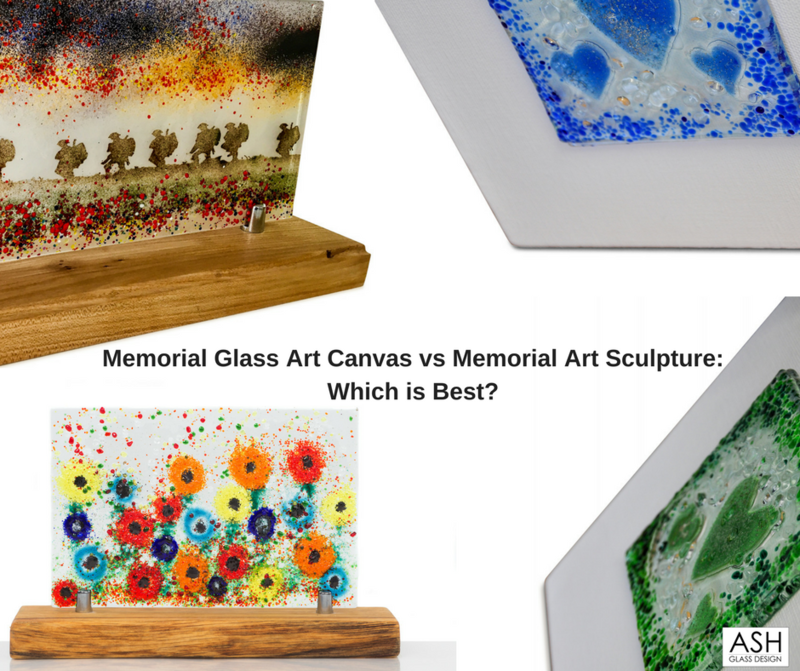 Memorial Glass Art Canvas vs Memorial Art Sculpture: Which is Best? Are you looking for the perfect piece of memorial glass art to remember a lost loved you’ve lost? There’s no right or wrong way to celebrate the memory of a loved one who has passed away. Some prefer to scatter their ashes, whilst others hold onto them in the form of a decorative urn – and some even consider memorial glass jewellery so they have something to hold in their hands. However, if your loved one was an art lover, or you’re more partial to decorative art than jewellery you can wear (and potentially lose), you might be considering a memorial glass canvas or art sculpture. Both can be a beautiful addition to your home; something to remind you of that someone special every day. But how do you choose? Having worked in glass design for over 20 years, I’m going to tell you the main reasons my customers choose one or the other, so you can decide for yourself. Why choose a memorial glass art canvas? Memorial art canvases are ideal if you have space on your wall, and love the idea of a loved one protectively watching over you. They can also be a good choice if you don’t have the space for a large sculpture in your home. These canvases make great gifts, but if you’re buying for yourself, they also make a lovely piece of art. You don’t even necessarily have to explain to visitors what’s inside them – it’s completely up to you. Because memorial art canvases typically use less glass than a sculpture, they can also be an affordable option if you don’t have the budget for a larger piece. Plus, they only need a small amount of ashes, so you can always get something else made later. TIP: Check my blog to learn more about the creation process that goes into my unique memorial art canvases. Why choose a memorial glass art sculpture? A memorial glass art sculpture is a great idea if you want to invest in a gorgeous and striking feature piece for your home. Some can be dramatic, whilst others can be made with your choice of design. Memorial glass art sculptures come in all shapes and sizes, and most of them sparkle beautifully in the light – making them perfect for placing on your windowsill. Another nice feature of memorial glass art sculptures is that they often come with wooden bases (depending on the type you get). This allows to you add a silver plate with an engraving of your own personal message. Plus, just like memorial art canvases, it only takes a very small amount of your loved ones’ ashes to create a sculpture you’ll admire for years to come. TIP: Read my blog ‘Ashes to Art: Fantastic Glass Sculptures’ to find out more about the steps I use to create my own memorial glass art sculptures. The first thing I say to anyone who is considering purchasing memorial glass art is to always call up and speak to your chosen company or artist first. Never send ashes away in the post until you are happy and confident that they’ll be in safe hands. To help, here are 8 questions to ask a cremation glass company BEFORE you buy, as I can’t bear to think of anyone being left disappointed. I’m sorry for your loss, but I hope this article has gone some way to helping you decide whether you’d prefer a memorial glass art canvas, or a sculpture to remember your loved one. Perhaps neither! There are so many options out there, and the choice is an entirely personal one. If there’s anything you’re feeling unsure about, please don’t hesitate to pop a comment below, or get in touch with me directly. I’ll do my best to help!